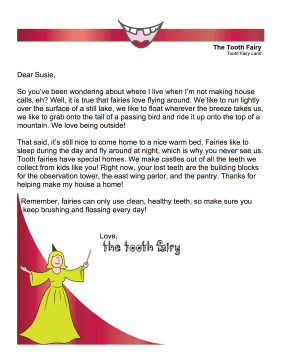 According to this letter from the tooth fairy, she lives in a castle made of the shiniest lost teeth from boys and girls who are good at brushing and flossing! So you've been wondering about where I live when I'm not making house calls, eh? Well, it is true that fairies love flying around. We like to run lightly over the surface of a still lake, we like to float wherever the breeze takes us, we like to grab onto the tail of a passing bird and ride it up onto the top of a mountain. We love being outside! That said, it's still nice to come home to a nice warm bed. Fairies like to sleep during the day and fly around at night, which is why you never see us. Tooth fairies have special homes. We make castles out of all the teeth we collect from kids like you! Right now, your lost teeth are the building blocks for the observation tower, the east wing parlor, and the pantry. Thanks for helping make my house a home! Remember, fairies can only use clean, healthy teeth, so make sure you keep brushing and flossing every day!